Great Northern Bowhunting Company was born during the summer of 1982. 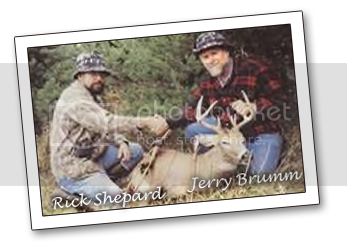 A burning desire to create these sleek hunting weapons soon became reality as Jerry and Rick were brought together quite by accident and with no initial plan to become part of the resurgence of real bowhunting. As soon as the first few yet unnamed bows were created it became apparent that these two bowhunters had a new purpose in life. In these times before instructional videos, "how to" books, and magazines... all was learned by trial and error. Eventually there emerged a new style of sleek, simply designed, functional hunting bow. This sleekness, combined with unequaled craftsmanship and performance has made Great Northern one of the most sought after bows on the market today. Each and every bow is carefully handcrafted one at a time. All of the core woods used are cut, milled and air dried by Great Northern. The laminations are cut and custom ground for each bow using only the very best of woods. Great Northern offers you your choice of woods, but prefers to work with osage, hickory and red elm. Keep in mind as you browse thru these pages that any bow's performance is 95% by design of bow. The core wood has very little effect on how a bow performs. The bows are very carefully laid up using the best epoxies and adhesives. They are then heat cured and slowly cooled to room temperature. From this "bow blank" the finished longbow or recurve is hand crafted to meet the customer's specifications. The bows are then sanded and finished with a tough epoxy finish in either a flat "hunter" finish or our popular hand rubbed satin finish. The finish used is far superior to that on most bows. It is harder, tougher, and yet more flexible against chipping and cracking in any weather. The innovative designs of these two bowyers also bring you the Jack Knife series of folding bows, the only hinged bow on the market today. And to compliment these bows, Great Northern has created the Professional Bow Quiver, the perfect companion when quick arrow accessibility and convenience is needed, again considered by most as being the best bow quiver on the market. After 25 years in business there was a need to expand. Now there are two individual companies with the same dedication for producing excellent handcrafted traditional products. This Great Northern Bowhunting Company and Great Northern Quiver Company are full time businesses and will be there for you tomorrow, next week, next year. The liberal warranty is honest and among the best in the business. If you ever have a problem, we will be here for you and treat you like we would like to be treated. After 35 plus years of living out his dream of building custom bows and hunting equipment Jerry retired. He sold the company to his oldest son Bob Brumm who had owned Great Northern Quiver Company for several years. The Tradition of bow building in the Brumm family is now carried on by Bob. He works with the same dedication to quality that Great Northern Bowhunting customers have come to expect. Bob carefully crafts each bow - one at a time. Many of you have met Bob at various traditional archery events and you most likely caught on to his enthusiasm for Traditional Archery and the simplicity of the sport. His passion for making top quality custom bows and quivers and a strong emphasis on customer service is his top priority .